The classic Vietnamese pork sandwich is transformed into a healthy salad. The traditional Vietnamese Banh Mi sandwich is reinvented as a healthy Banh Mi Salad. Life is a ride. And so is my body clock. Ever since the husband started his new job, he’s been leaving home at 5.30am every morning, which means that I had to wake up before 5am daily compared to my normal waking up time at 6.30. Interestingly, this new habit makes me feel better and healthier and so does my husband. Although he normally is not a morning person, but nowadays, he feels like he has more energy and could accomplish more things during the day. As for me, my new habit of waking up early pushes me to exercise better and eat better. Sometimes being a picky eater is a good thing, don’t you think? 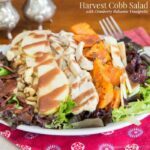 Today I’m sharing a salad recipe… a delicious salad recipe to be exact. I like Banh Mi Sandwich even when it only comes with fried egg. When I was in college, my friend and I often had this sandwich in between classes, right around lunch time. Good thing I only have classes two days a week so I did not feel overwhelmed by the sandwich during those two years of college. The sandwich place that we often went to always add Maggi sauce to it; hence the mayo spread tastes different compared to other sandwich shops. It’s unique and yet delicious. Well, today, I’m sharing this banh mi in salad and I’m adding pork meatballs on top, instead of fried egg. What I like about this salad is the dressing. Okay, I lied. I like everything about this salad. Pork meatballs are so easy to make and you only need 1 bowl to combine all the ingredients. And while you wait for the pork to harden a bit, you can start working on the pickles. 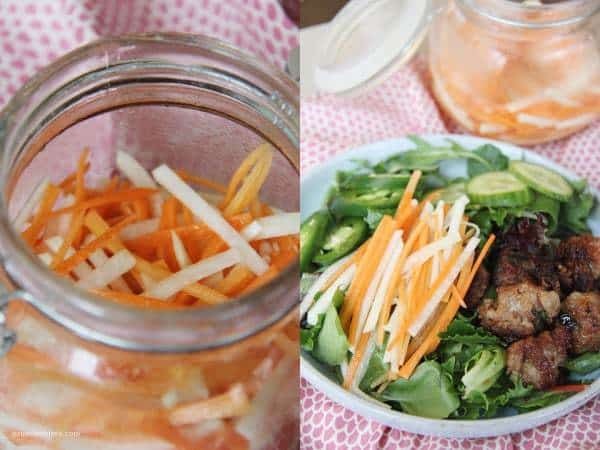 Carrot daikon pickles are delicious and you only need 30 minutes to marinate it. Bonus point, you can enjoy this pickles alone or add them to your favorite salad. And the dressings… fresh and flavorful! I did not add lots of sodium to this; however it brings all the flavors out when you eat it with pickles and pork meatballs. I hope you like this salad as much as I do because it does bring sunshine to the gloomy SF days. Combine all the ingredients, except cornstarch, in a bowl. Roll into approximately 16 balls (1 ounce each) and roll in cornstarch to completely cover the surface, refrigerate for 20 minutes. Heat 2 inches of vegetable oil in a medium saucepan or a large pot over medium-­high heat. Add meatballs into the hot oil and fry for 5 minutes. Don’t crowd them. Remove the meatballs to a paper towel-­lined plate to drain. Combine all ingredients in a jar and refrigerate for 1 hour. 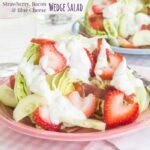 Combine all ingredients and drizzle over salad. Add salad greens to your plate and top with jalapeno, cucumber, and meatballs. I’m so happy you enjoyed the recipe, Amy, and I love your use of kale in the salad! Delicious! Eager to make this. How many servings does this recipe make? Bethany, the recipe uses a pound of meat, so if you’re serving it as a main dish, you’ll get 4-5 servings from it. I hope you enjoy it! This was outstanding! I love love love Bahn Mi but am trying to eat less bread/carbs so this was right up my alley. The meatballs were seriously out of this world! My fiance is still raving about it. Thank you for sharing such an incredible dish! My only add-ons were quinoa and a spicy mayo (mayo + sriracha) to dollop on the meatballs but other than that I followed the recipe verbatim. Thank you! 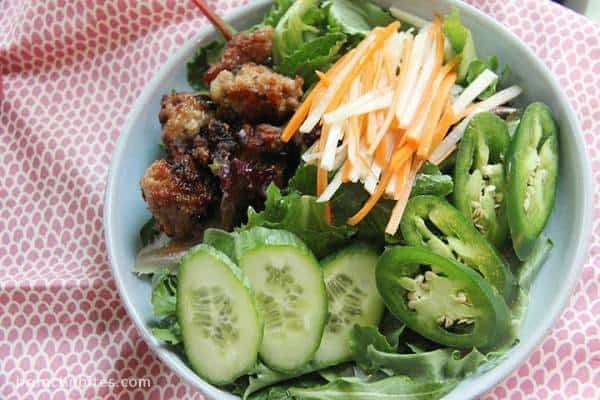 Emily, I’m so happy to hear that you enjoyed the Banh Mi salad recipe! Thank you for coming back to let me know. I love this. My kind of food. 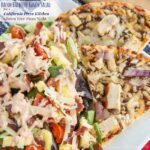 I’m a huge fan of salads and healthier options are always the better options! Thanks for linking up at delicious dishes recipe party! Oh my…I’ve pinned this and can’t wait to make it. Looks just delicious. This is one of my most favorite kind of meals…kind of a deconstructed kind of thing on a bed of lettuce. Can’t go wrong. This looks so good! Pinned! Thanks for sharing at Merry Monday, hope to see you again next week! My husband is going to LOVE this! I can’t wait to make it for him! Now this is my kind of salad- I’m loving the addition for a jalapenos- spicy is always a good thing! Pinning! I love making banh mi but never thought I would make this into a salad. I love to try this out! It’s such a great idea! Love finding ways to enjoy things I like to eat but make them lighter.